The above picture is one of the first team photos of St Clarets, taken in Botwell Parish Hall. Pictured back row l-r: Denis McCarthy snr; Mark Reynolds; John McCarthy; Danny Collins jnr; Danny Collins snr; Gerard O'Shea; Kevin O'Shea; Paul McDermott; Jack Carolan; Mick O'Shea. 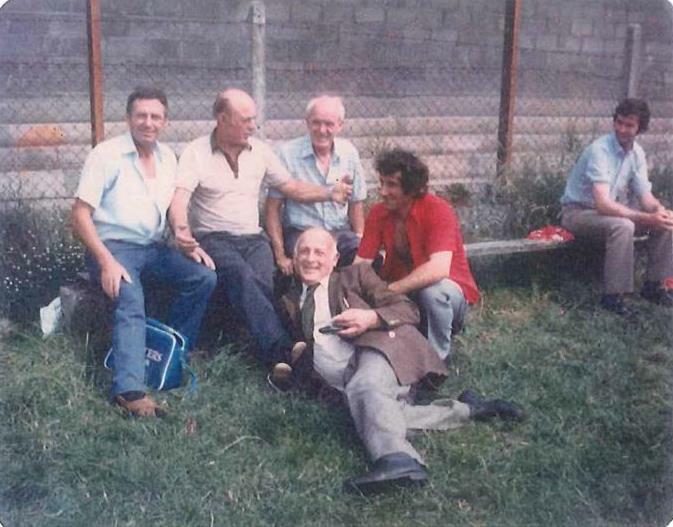 Front row l -r:Denis McCarthy jnr; Mick McGee; Des O'Hara; Eamon Collins; Tim Carty; Loz Forde; Barry Carolan; Kevin Gilmartin; Kerry O'Connor; Brendan Collins. Denis McCarthy and other luminaries from our past discuss tactics. 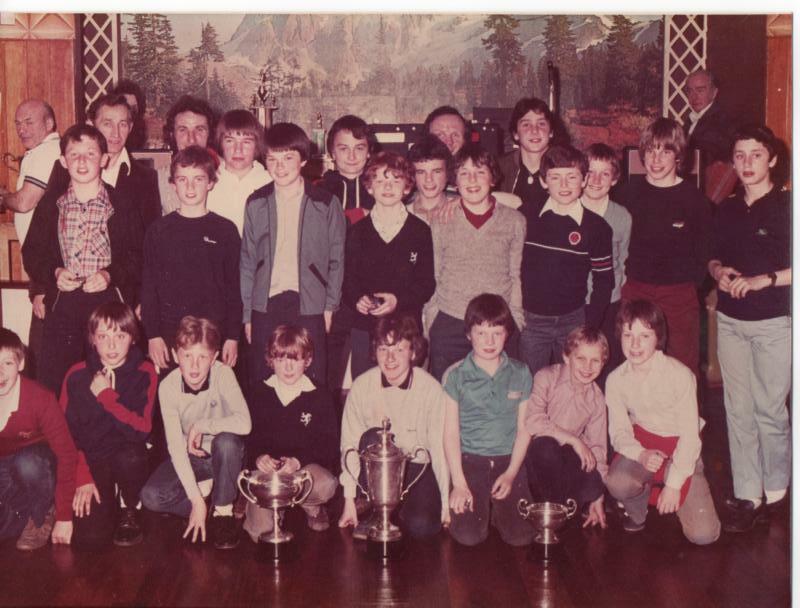 The above picture was taken in Botwell Club after the St Clarets returned from the Feile in 1982. In 1982 St Clarets competed in their first ever Intermediate County Final when they took on the emerging Tir Chonaill Gaels in the October decider at Ruislip. The club negotiated their way to the final by way of a very impressive display against John Mitchels in the semi-final, a game that ended 3-13 to 0-1. Top scorers in that game were Denis McCarthy with 1-7, Mayo man Brendan Walsh with 1-2, local lad Kevin Platt (1-0), the irrepressible and irreplaceable Dave Roe (0-2) and John Flanagan also with 0-2. Sadly, the semi-final was to be the highlight of the 1981 campaign and in the final the Donegal men proved too strong for the young Clarets side and ran out 1-8 to 0-5 winners. Best for St Clarets on the day were Paul Treanor, Denis McCarthy, Seamus Waites, Eamon O&apos;Shea, Brendan Walsh and John Carey. It would be another 7-years before the side would return to the intermediate showpiece, but when they did they made it a worthwhile trip. Thankfully many of the players of 1982 were still with the team in 1989. 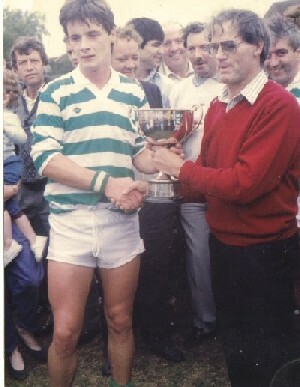 Captain Martin Hession is presented with the Intermediate Championship trophy by the late Martin Diggins and becomes the first St Clarets player ever to receive a County Championship trophy. 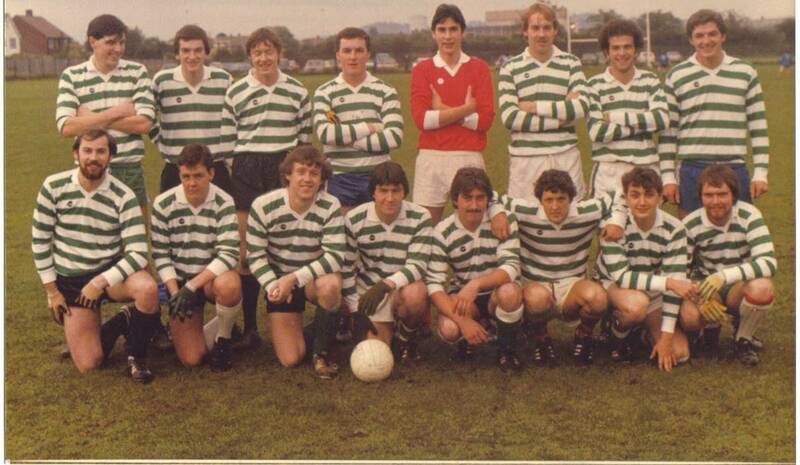 And below, the St Clarets team and mentors before the 1989 Intermediate Final against St Anthonys. The History Makers. Pictured back row l-r: John Marran, John Kelly, Eamonn O&apos;Shea, John McCarthy, Brendan Boyle, John Collins, Tommy Quigley, Ollie Walsh, Gerry Lynott, Kevin Gilmartin, Declan Ryan, Denis McCarthy (manager). Front row l-r: Tony O&apos;Sullivan, Adrian Adair, Martin Hession, Danny Grehan, John Carney, John Carey, Denis McCarthy, Colm Lynott, Paul Treanor, Gerry O&apos;Connell, Finbar O&apos;Dwyer, Brendan Curran, Chris Lloyd (Chairman). 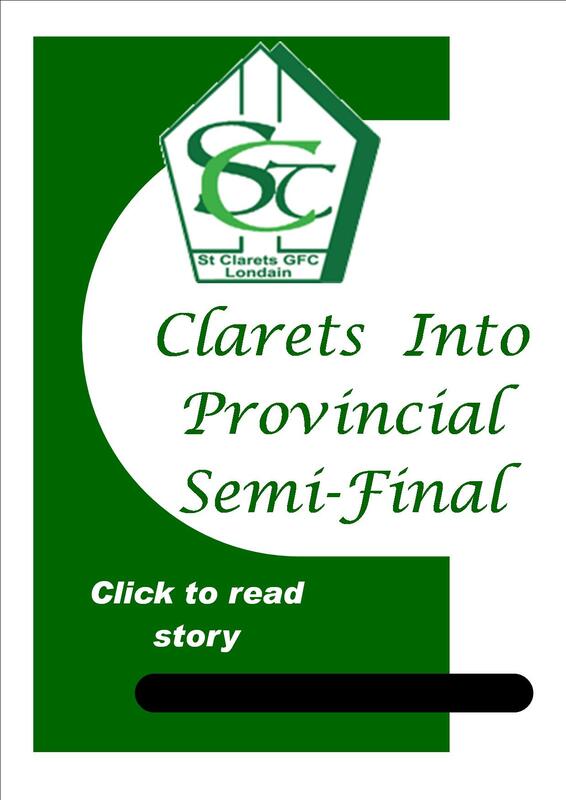 St Clarets of Hayes came of age in style on Sunday last, when, 18-years after their formation, they succeeded in winning the London Intermediate Football Championship for the first time. This win, achieved with style and enthusiasm against St Anthonys of Reading, ensures St Clarets of a place in senior football next season, and on the evidence of this display, they have very little to fear from any of the top teams. But in lauding the merits of the Hayes club, one can only commiserate with the gallant losers, who once again have missed out in their quest for a major honour. Undoubtedly the game of the year, both finalists delighted the sizeable attendance with their entertaining style of play in a game punctuated with some superb scores. St Clarets, who have assumed a new lease of life since the appointment of Chairman Chris Long from Tipperary at the start of the year, looked likely winners from the word go, when it became evident that the emphasis was going to be on attack. 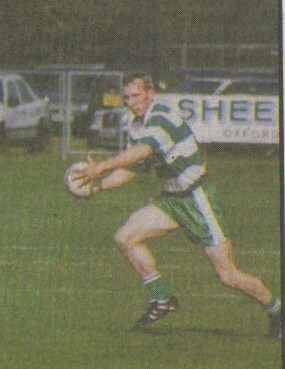 Club followers looked the full forward Gerard Lynott to supply the ammunition and in this they were not disappointed. After an early effort which sailed narrowly wide of the upright, Lynott was on target in the 5th minutes when he beat full back Damian Carville all ends up to send the ball past the diving John Doherty of Donegal. A further goal by corer forward Declan Ryan, left St Clarets on level terms at the interval. But a succession of points from free-taker John Carey gave St Clarets the edge in the second half and overall, their four-point win accurately reflected their dominance. Fielding no fewer than nine London-born players who have progressed through under-age ranks, the new champions looked exactly what they are â€“ London&apos;s most entertaining side, who combine unbounded skills with a high degree of sportsmanship. This victory should do much to expand still further local interest in the GAA affairs in the Hayes area and certainly it proved that St Clarets have come to stay as a major force. First and foremost Sunday&apos;s victory was due to the stranglehold on midfield gained by Kevin Gimartin and Martin Hession, who established a match-winning partnership from the outset. Ignored by the London electors for the past two years, Hession has again confirmed that on sheer ability, he stands up to comparison with many players who are relying on past achievements to carry them through. Much of the credit for this win must go to a defence that successfully snuffed out the threat posed by players of the standing of Brian Casey, Eugene Murtagh, Rory Oâ€™Neill and Noel Surliss. The full back line of Eamonn O&apos;Shea, Tommy Quigley and John McCarthy were quite superb, while John Carney, now back from an extended trip to Australia, never put a foot wrong in the half back line. Danny Grehan, who unobtrusively gets through an immense amount of work, again demonstrated his worth with excellent ball distribution, although here he met with ready responses from fellow forwards Denis McCarthy and Ollie Walsh. St Anthonys&apos; defence must take the blame for conceding the first goal, although here Maurice Somers, Eamon Maguire and JJ Burke improved in confidence as the game progressed. The switch of Maurice Somers to midfield late in the game brought about an instant improvement, but by then the outcome had already been decided. St Clarets: John Collins; Eamonn O&apos;Shea, Tommy Quigley, John McCarthy; Paul Trainor, Colm Lynott, John Carneyâ€™ Kevin Gilmartin, Martin Hession (0-2); Ollie Walsh (0-1), Denis McCarthy, Danny Grehan, Declan Ryan (1-0), Gerard Lynott (1-0), John Carey (0-7). Proud Mayo man Kevin Lynott along with his three sons: Gerry, Colm and Kevin, who all played key roles for St Clarets in last Sunday's Sean Shields Final triumph. St Clarets, recent winners of the Intermediate Football Championship, confirmed their superiority at this grade with a one-point win over neighbours St Josephs in the final of the Sean Shield Cup at Ruislip. However, had St Josephs been on target with their shooting, the likelihood is that they would have won this prestigious tournament. They led by 0-6 to 0-4 at the interval, but they were unable to withstand the storming that has been the hallmark of all of St Clarets major wins this season. The winners were short several of their Championship winning side and it was the inclusion of late arrivals, Eamonn Oâ€™Shea and Kevin Gilmartin at half-time that swung the game. Goalkeeper John Collins was outstanding making several fine saves. Further afield, captain Martin Hession and John Carey, scorer of 0-5, were most prominent. St. Clarets: John Collins; John McCarthy, Tommy Quigley, Brendan Boyle; Adrian Adair, Paul Trainor, John Carney; Colm Lynott, Martin Hession; Colin Keane, Denis McCarthy, Kevin Lynott; John Carey, Gerard Lynott, John Kelly. Subs: Kevin Gilmartin, Eamonn Oâ€™Shea. 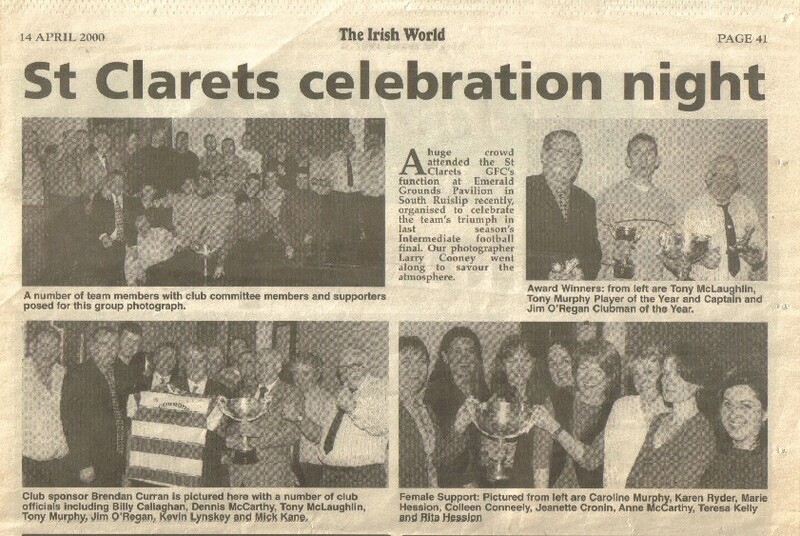 After an incredibly successful 1989, the players and supporters of St Clarets enjoyed a great presentation night at Botwell. Pictured are the players and the spoils of their particular wars from 1989. Pictured - Back row l-r: Ollie Walsh; Kevin Gilmartin; John Collins; Eamonn O'Shea; John McCarthy; John Kelly; Gerry Lynott; Colm Lynott; Paul Myers; John Carney. 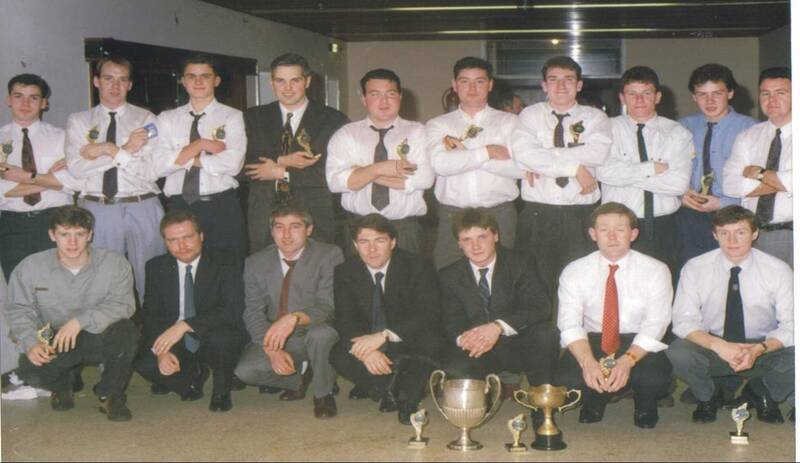 Front row l-r: Colin Keane; Laurence Forde; John Carey; Denis McCarthy; Martin Hession; Paul Treanor; Mark Mellett. Close call against our "noisey neighbours"
The opening round of the 1993 SFC pitted St Clarets against our closest rival St Brendans. Despite being absolute underdogs, we nearly pulled off a famous win, but had to settle for a draw in the end. To read the match report, just click on the image to enlarge(adobe reader required). More features on the 2002 team can be found in "Hall of Fame"
In the summer of 2002 St Clarets stormed into the final of the Senior Football Championship where they took on their age-old rivals St Brendans. Sadly the club weren't successful on that occasion, nonetheless it was a landmark occasion for the club. The picture of the St Clarets team that appeared in the county final programme. St Clarets proved just how far they had come as a team over the previous few years when they recorded this impressive and comprehensive victory over London's top club at the time Tir Chonaill Gaels. This had followed on from beating them in the SFC in 2002. There was no doubt that by 2004 St Clarets had established themselves as team to be reckoned with. The 2004 IFC in London will be remembered as one of the mostly keenly contested in recent memory. And it wasn't just the closeness of the games that captured the attention of the public in London that summer, but also the quality of the football being played, in particularly by Moindearg, Round Towers and of course St Clarets. Ultimately it was St Clarets who ran out winners of the Championship, but due credit needs to be given to their worthy opponents throughout the competition. To read the match reports of our classic group matches against both Moindearg, Round Towers and Harlesden Harps, just click on the images to enlarge(adobe reader required). ABOVE: The Murph-Maister - One of the chief architects of the Clarets' victory was veteran Tony Murphy, who sprang to life in the second half, just when his team needed him most. BELOW: The St Clarets team from last Sunday. Pictured back row l-r:Derek McMahon, Brian MacNeice, Colm Lynott, John Ryan, Tony Murphy, Paddy Donaghy, Erik Kinlon, Martin Falvey, Donncha Ryder, Dan Keating. Front row l-r: Martin Hession, Stevan Sherry, John McDermott, Marty Hughes, Finbar O'Reilly, Aidan Donaghy, Eamon Colleran, Patrick Lynott, Dan Sheehan, Paul Myers. St Clarets took the vital penultimate step towards regaining their senior football status with some degree of confidence on Sunday, when they delivered a comfortable and totally deserved four-point victory over an in-form Harlesden Harps. Having completely dominated the first period, the Hayes team went in at the break just three-points ahead, a lead which in truth did little to justify their superiority. That first half dominance was challenged further through the opening exchanges of the second half, as Harlesden pegged back their lead and ultimately drew level after 14mins of second half play. However, a veteran-charged closing quarter revival saw the Clarets back into the Intermediate decider with some considerable ease. Strangely, given that the Hayes side had been so impressive throughout the league stages of this competition, Harlesden went into this game as slight favourites. Having been involved in the play-off stages of the group section, Harlesden went into this match with the advantage of having played two tough Championship matches at a time when John Kellyâ€™s team were making do with one fairly meaningless league game. Added to that, the Clarets had to cope with the absence of Alec MacIndoe through injury and the unavailability of Paddy Quinn. Given those two factors, it wasnâ€™t hard to see why Harlesden held the favouriteâ€™s tag. However, despite the slight favouritism of their opponents, it was actually St Clarets who got off to the better start and took the lead through the immaculate free-taking of man-of-the-match Derek McMahon. The big Monaghan midfielder completely dominated all aerial exchanges in the first half, ended the game with six-points to his name and inspired his team to a place in the 2004 final. 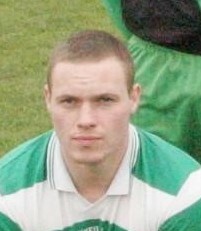 John Devine answered quickly for Harlesden with two-points within a minute and many were beginning to question the wisdom of placing John Ryan at full back, in place of the regular incumbent Dan Keating. However, those two early points were to be the only contribution that Devine would make in the game, and Ryan soon got to grips with the task at hand in and around the St Claretsâ€™ square. Marty Hughes equalised for St Clarets with a free, before McMahon pushed his team further ahead with another. Trent Fitzparick finally made a contribution to proceedings with a magnificent effort from fully forty yards. Much of what Harlesden have achieved in the past few weeks has been built around the superb form of the young Cavan man, and certainly that point was of extreme importance to his team. Without a fully functioning Fitzpartick, Harlesden were going to be of little threat to St Clarets. That Fitzpatrick score however only acted a s a springboard for a flurry of scoring from the Clarets, with Patrick Lynott, McMahon and Erik Kinlon all obliging with three quick points. Fitzparick replied again with a point from a free, having capitalised on an illegal hand-pass from Ryan close to the Claretsâ€™ goal. But moments later missed an easier chance, when his twenty-metre free was blocked down. Half time sounded and a disgruntled Harlesden left the field three points down, having failed to make any real stand for themselves in that opening period. Chastened by the half time sermon, Harlesden made the better start to the second half when they landed three-points without reply through Mark Charles (2) and Kevin Sullivan. Quarter of an hour passed and Harlesden were completely dominating the midfield battle, with St Clarets struggling to get the ball out of their own half. The decision to move wing forward Eamon Colleran back to mark Fitzpatrick in place of the injured Aidan Donaghy was not working for the Hayes men and Fitzpatrick was becoming more and more influential, while at the same time Colleranâ€™s menace in attack for St Clarets had vanished. A succession of necessary bookings by referee Pat McNabb resulted in a real edge developing in the game, but also an increasing number of players walking the narrow disciplinary tight-rope. Finally St Clarets found their stride with a point from substitute Martin Falvey, before Fitzpatrick repeated his first half feat of scoring from out near the sideline, this time with a free. Clarets were just about managing to stem the tide of Harlesden pressure and veterans Tony Murphy and Martin Hession began to dictate things in and around the middle. Time and again Murphy burst from midfield having collected loose ball and from those breaks the Clarets set up three scores for themselves, with two of them once more coming from the boot of McMahon and the other from Hession. Another Claretsâ€™ sub, Dan Sheehan, pointed to leave four between them and then Hughes tapped over an easy free to make the lead even more comfortable. Cruising with the sixty minutes expired, the Clarets then committed the cardinal sin of taking their eye off the ball and that presented Fitzpatrick with a goal chance from a 20-metre free, which he planted into the top corner of the net, with St Claretsâ€™ backs in disarray, arguing with themselves and the referee. A lesson was learnt though and they gathered themselves once more and Hughes was again on hand to knock over a close in free before Sheehan proved his value as super-sub with the final score of the game from close in to leave five-points between them at the end. Claretsâ€™ focus this year was all about winning back senior status and as the season enters its dying embers, they are still on course for that. The victory owed much to their veteran campaigners, with Colm Lynott, a survivor of the 1989 Championship winning team, impressing greatly at centre back. In midfield the high scoring Derek McMahon and the often unheralded Brian MacNeice were awesome for most of the game, save for a fifteen minute spell at the start of the second half. In attack, Martin Hession, another survivor of 1989 and Tony Murphy, both showed up at important times to make big contributions, while young Patrick Lynott finally put behind him his difficult second season, with a good all-round display that included an excellent point. Marty Hughes, an All Ireland winning minor with Tyrone in the company of the likes of Brian McGuigan and the late Cormac McAnallen, showed a big return to form with some nice touches, although sometimes he could be accused of taking one-too-many of those touches. For the losers, well the disappointment of going out in the semi-final will be magnified by the knowledge that they could have done so much better. Their usual inspirations, John Coady and the Brennan brothers were kept quiet for large chunks of the game, while Trent Fitzpatrick only sparked on occasions. Full forward John Devine threatened to rule the roost on the edge of the square, but was halted by a wily old fox in John Ryan. Elsewhere they received solid performances from John McGinley and Cormac McGee. St Clarets scorers: D McMahon 0-6 (all frees); M Hughes 0-3 (all frees); D Sheehan 0-2; P Lynott, E Kinlon, M Falvey, M Hession (all 0-1). 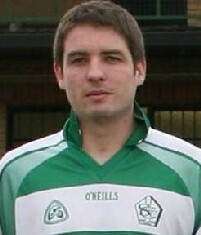 Harlesden Harps scorers: T Fitzpatrick 1-3 (0-1f); J Devine 0-2, M Charles 0-2, K Sullivan 0-1. Champions again: The St Clarets team that secured the Intermediate Championship on a wet and miserable Saturday evening at Ruislip. Pictured - back row l-r: Derek McMahon, Brian MacNeice, John McDermott, Martin Hession, John Ryan, Stevan Sherry, Paddy Donaghy, Paul Myers, Paddy Quinn, Donncha Ryder, Colm Lynott, Martin Falvey. Front row l-r: Gerry Lynott, Marty Hughes, Erik Kinlon, Patrick Lynott, Aidan Donaghy, Eamon Colleran, Finbar O'Reilly, Dan Sheehan, Colm Lynott jnr. Missing from picture Tony Murphy and Dan Keating. Rueben Carter was a black American middleweight boxer who was jailed for a murder he did not commit in the prime of his career. In the film â€œThe Hurricaneâ€� based on his story, Denzil Washington delivers the lines: â€œHate put me in here, but love is going to bust me outâ€� when talking to a young fan who was fighting his case through the courts. In the case of St Clarets, it wasnâ€™t so much love that busted them out of their Intermediate sentence, but a goal and a point from their skipper Paddy Quinn, three valuable points from ace midfielder Derek McMahon and man-of-the-match performance from Eamon Colleran. Like the relationship between the convicted criminal and the one that they love, the St Claretsâ€™ sentence was to test the strength of the relationship between the club and its players. Some chose to jump ship, while others chose to stay and fight the hard yards. Saturdayâ€™s victory was proof that unity is the best form of defence for anyone who feels they have been wronged. For Round Towers, similarly convinced of their right to be among the big hitters in London, the awful truth is that they will have to remain for at least one more season as an Intermediate side, but on the evidence of what they have shown throughout 2004, they will be a mighty difficult team to resist next year. They possess a wonderful blend of youth, experience, energy and charisma and were a delight to watch for most of the year. With these two teams having drawn 2-4 apiece in the group stages of the Championship, the chances of a classic seemed remote and with the deluge that persisted throughout this game, it was little wonder that we were left with a scrappy, but all the same entertaining final. Both sides struggled to get any sort of control of proceedings in the opening half and at the interval the score stood at four-points apiece. While there had been no shortage of action, both sides were guilty of poor finishing. However, in fairness, their cause was not helped much by firstly, the rapidly deteriorating conditions under-foot and second, the poor quality of ball coming into them. Far too often, the attacking side were breaking down their own assaults on goal by misplacing even the easiest of passes. Finally, Marty Hughes got the Clarets off the mark with an early free on 7mins, this coming seconds after Gus Oâ€™Brien had missed a similar effort for the Towers. Almost a quarter of an hour had passed before the south Londoners got going themselves, in terms of scoring at least and it was midfielder Liam Barron who lofted over after Claretsâ€™ keeper Myers had punched out a free from Oâ€™Brien. Clarets scored again with a free from McMahon, who appeared to be picking up where he had left off the previous week, before Colm Heaney, also showed that last weekâ€™s display against Moindearg was no flash in the pan, with a great score from 30 metres. Oâ€™Brien finally made his mark as a free-taker with an impressive effort from distance to put the Towers ahead for the first time, but that was quickly cancelled by a point from Erik Kinlon, who showed great composure to slot over when many would have succumbed to the weight of pressure being put on by the Towersâ€™ defence. The younger of the Heaney, Kevin, then made his first decisive contribution of the day with a point to restore his sideâ€™s lead, but once more McMahon came to the rescue of the Hayes side with a free to leave matters level at the break. By the interval few had had their pulses set racing, save for those directly involved in the game, but at the same time, there was a genuine honesty about the approach of both sets of players. Given better over-head and under-foot conditions, no doubt these two teams would have produced a game to be proud of. Come the start of the second half, it was Towers who got matters up and running very swiftly with a brace of points from Kevin Heaney and the hardworking Barry Shortall. Two points down and not playing particularly well, the Clarets faced a situation similar to the one they faced against Harlesden in the semi-final, as they struggled to get to grips with the desire of the opposition. However, just as they had done the previous week, they kicked into action about ten minutes into the second half and for fully twenty minutes, they tormented the opponentâ€™s defence with what can only be described as an exhibition of keep ball. Throughout that twenty minute spell, the Towers struggled to get past half way, and whether they played it short, long or wide from kick-outs, the Clarets were totally on top of proceedings. Three points in four minutes from Hughes, Paddy Quinn and McMahon, drove them into the lead, with McMahonâ€™s effort from the sideline fully forty metres from goal, being the sort of score upon which the destiny of a Championship is decided. Eamon Colleran got another equally impressive score from wing back, when he interchanged with Patrick Lynott to score a quite brilliant point. Moments later the gods conspired against Patrick Lynott and smiled down on Niall Dillon, when a poor kick-out from the Towersâ€™ keeper fell to Lynott, who lobbed the ball back over Dillonâ€™s head, only to see it bounce against the crossbar and come out. A goal of that nature would have sealed what had been a breathtaking period of football from John Kellyâ€™s team. Fortune however deserted Dillon moments later, when another massive McMahon free landed in the Towers area and Dillon dropped the ball into the path of Quinn, who swept it home. The five point deficit could well have become ten in the next six minutes, as the men in green and white hit five wides in succession, and the Towersâ€™ hopes of senior football in 2005 lived on. With the sixty minutes almost elapsed, a mix-up in the otherwise immaculate St Clarets full back line, allowed Robert Campbell the opportunity to blast past Paul Myers following some great work from Shortall, and suddenly the Clarets were holding on to that most dangerous of leads: the two-pointer. A fifty was lobbed into the slippery, sodden goalmouth by Oâ€™Brien for the Towers and captain Quinn was there for St Clarets to gather and clear to avert danger. As the ball reached halfway, referee Beano Collins blew for full time and St Clarets had reached what they considered to be their destiny. The victory was built from the fact that they stayed united for the year, save for the few newcomers who thought better and moved on. As in the Senior final, the victory was built very much from the back and the full back line of Aidan Donaghy, Finbar Oâ€™Reilly and the quite exceptional John Ryan were almost faultless. Colm Lynott showed maturity at centre back, while Eamon Colleran was a thorn in the Towersâ€™ side, both in defence and attack for the entire hour. In midfield, Brian MacNeice was his usual solid self and Derek McMahon was once again breathtakingly accurate from difficult frees in terrible conditions. Paddy Quinn weighed in with the goal, but other than that failed to sparkle in the way that he has for most of the year, while Patrick Lynott delivered a near perfect second half, despite the relentless persistence of the exceptionally determined Michael English. Marty Hughes, a reluctant returnee to football at the start of the year, finished it off with a Championship medal to go with his All Ireland Minor gong, and is no doubt grateful for the hard work he put in at the start of the year. Towers will be bitterly disappointed with the fact that they will once again be playing Intermediate football next year. Having lost the services of James Kinahan, Paddy Connolly and Ollie Fitzgerald, all recognised London senior footballers, in the space of three short weeks in March, they may well feel that their season was jinxed. Like their opponents today, their spirit was to be commended and it will serve them well next year. Throughout the team they had stars and in the first half, their back line made life more than a little difficult for the Clarets. Michael English made sure that Patrick Lynott had to work for every ball he laid his hands on, Timmy Donovan marshalled the experienced Martin Hession well and Michael Murtagh just carried on doing what he has been doing all year, defending well and setting up attacks. Gus Oâ€™Brien had a quality hour, while Barry Shortall went everywhere on the pitch looking for possession. The Heaneys were at their mischievous best for most of the game, although Kevin was starved of ball in the second half and Robert Campbell stayed focused, despite the excellence of John Ryan, and was on hand to grab that late goal at the end. Sadly though, it just wasnâ€™t enough for Kevin Kellyâ€™s men. St Clarets: Paul Myers, John Ryan, Finbar Oâ€™Reilly, Aidan Donaghy; Paddy Donaghy, Colm Lynott, Eamon Colleran 0-1; Derek McMahon 0-3 (all frees), Brian MacNeice; Paddy Quinn 1-1, Tony Murphy, Erik Kinlon 0-1; Marty Hughes 0-2 (0-1f), Martin Hession, Patrick Lynott. 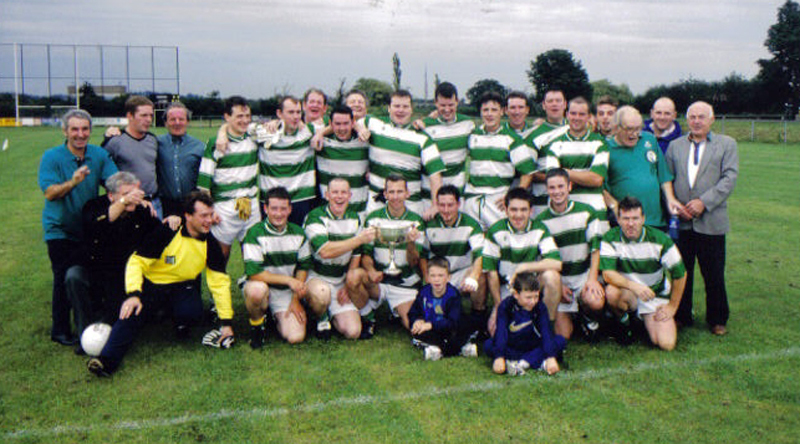 Having won our third london Intermediate Championship in 2004, we set out on our first ever adventure in Provincial competition, with the prize at stake, not just being the Championship of Britain, but also a place in the All Ireland quarter final. First up for us was a tricky tie against St Colmcilles of Gloucester, a challenge we overcame with surprising ease. Next up was a face-off with the very experienced and highly regards St Peters of Manchester. In what proved to be an unfortunate yet fitting finale to our 2004 season, we went out of the Provincial Championship at the semi-final stage. But once again, St clarets served up a superb exhibition of football that kept supporters on the edge of their seats, right up to the final whistle of extra time. To read the match reports of our Championship of Britain adventure in 2004, just click on the images to enlarge(adobe reader required). Following on from his Lifetime Achievement Award in 2004, Denis McCarthy spoke to The Irish World about the fifty years he has spent involved with the GAA in London. To read the interview in full, just click on the images to enlarge them(adobe reader required). Having enthralled and entertained the London public in 2004 with some titanic battles between the two sides in the Intermediate Football Championship, St Clarets and Round Towers went head to head again in the Conway Cup the following year. Having been denied glory in 2004, Towers made some amends for their disappointment by knocking Clarets out of the prestigious senior tournament. To read the match report just click on the image to enlarge(adobe reader required). Up-setting the big boys has always been the trademark of St Clarets and defeating Kingdom Kerry Gaels in the SFL in 2005 was just another example of how St Clarets like to upset the odds. Once more Patrick Lynott's goal-scoring instincts came to the fore for St Clarets. To read the match report just click on the image (Powerpoint required. Use page down to advance slideshow). Once in a while a club is lucky to benefit from the services of a genuine talent of the game. Tyrone man Marty Hughes was one such talent and through the mid 2000s the All Ireland minor winner delighted followers of St Clarets with some fantastic exhibitions of football. On this occasion, it was Harlesden Harps who were on the receiving end of Hughes' slight of hand and foot. To read the match report just click on the image (adobe reader required). Like all great performers, there's always the chance of one last big day out. Caesars Palace in Vegas is the favoured destination for most, but the Gaelic football pitches of west London do just as well for some. Two of Galway's finest, cousins John Kelly and Martin Hession, decided to begin their final tour against Robert Emmetts. 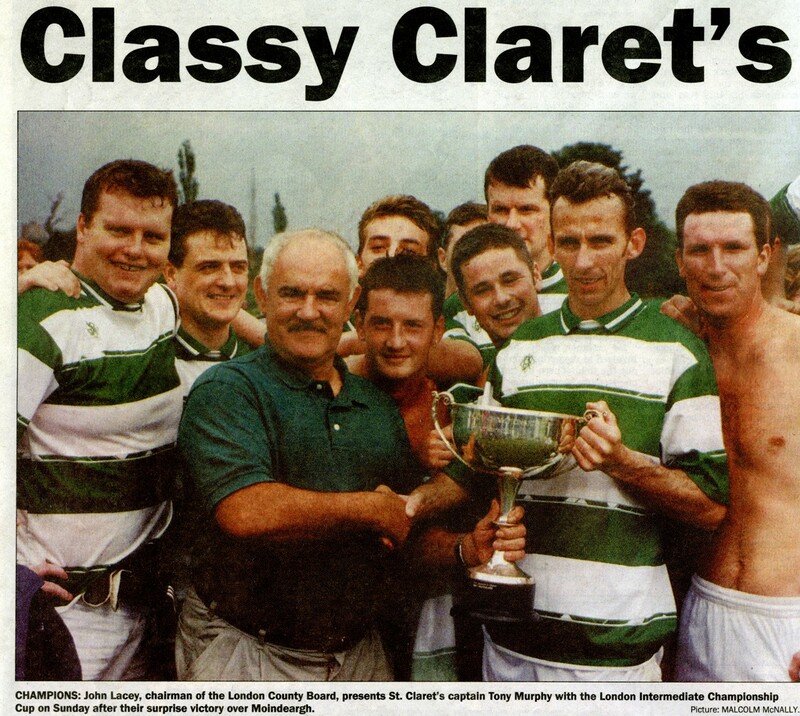 Ten years after the club's first ever Intermediate Football Championship triumph, St Clarets were back in the limelight again when they were once again crowned Intermediate champions of London. 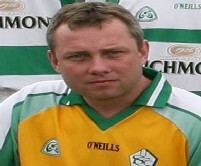 Many of the previous winning team, such as John Kelly, Martin Hession, Gerry Lynott and Colm Lynott were still in the side, testimony to the unique values and traditions of St Clarets. To read the full match report on this game, just click on the images to enlarge (adobe reader required). If one word could describe the philosophy of St Clarets, then that word would be bouncebackability. Having suffered a heavy Championship defeat against Tir Chonaill Gaels the week before, the veterans of St Clarets proved that they weren't the kind of spirits to sit back and feel sorry for themselves as Na Pairsaigh were to find out. Having worked so hard to gain promotion in 2004, St Clarets were in no mood to relinquish their senior status in 2005. With veteran Martin Hession rolling back the years, the Hayes men put on their customary dogged display to secure a dramatic draw against Shalloe Pearse in an entertaining relegation play-off. Aided by the brilliant Marty Hughes, the St Clarets attack notched 0-12 for the afternoon, enough to ensure the club lived to fight another day in the SFC relegation battle. For years games between ourselves and St Brendans always had that little extra bit of spice to them and often we were able to produce performances above and beyond the norm when we faced the old-enemy. Sadly, on the occasion of this Tipperary Cup semi-final, we were unable to raise our game to the levels needed to defeat the then reigning county champions. Many thanks to the Mulvihill family for sending in these pictures from when Francis and Martin wore the green and white hoops. 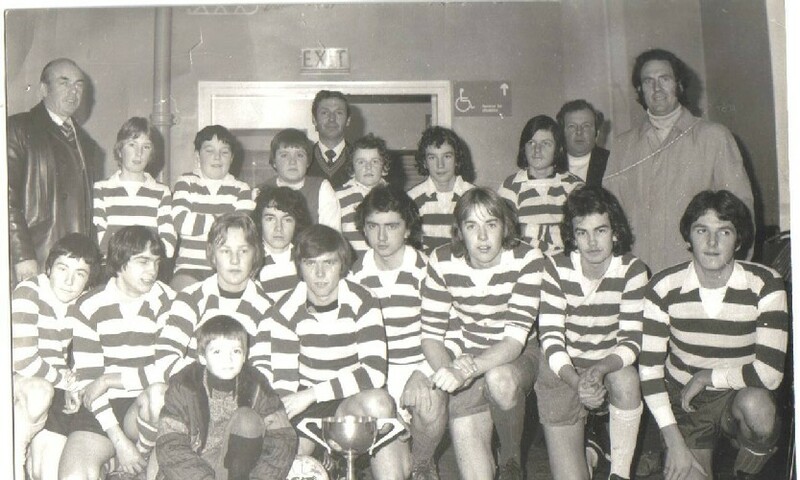 Thanks to Richard Burke for sending in this photo of the St Clarets Under 14 Championship winners from 1982. To enlarge the picture, click on the image below. Front Row: Eamon Collins, Gary Hennessey, Richard Burke, Martin Mulverhill, Colm Lynott, John Kennedy, Sean Delaney, Gerry Lynott. Second Row: James Farine, Liam McNamara, Derek O'Hare, Francis Mulverhill, Tim Downey, Mark Kane, Colin O&apos;Toole, Mick Bodley, Steve Murphy. 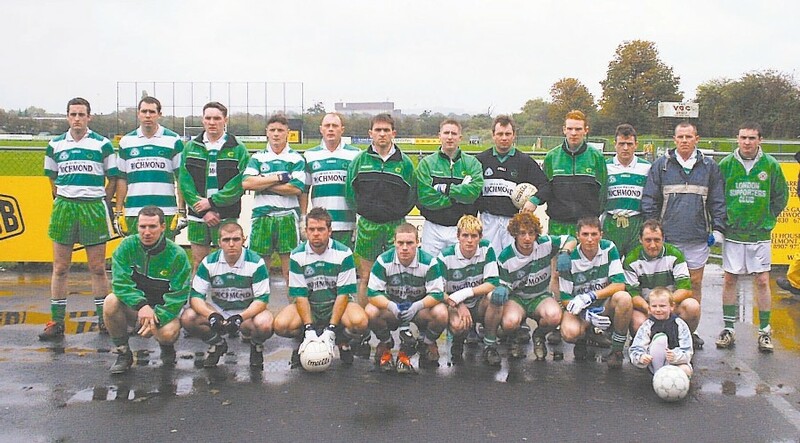 Back Row: Denis McCarthy, Mr. Delaney, Kevin Lynott, Eamon McElihenny, Danny Murphy, David O&apos;Mahoney, Roly, Mark Smith. Upon our return to the SFC in 2005, we were placed in a group that included the once mighty Parnells, a club that was slowly starting to emerge from nearly 20 years of under-achievement. On this occasion, even the by-now legendary recovery powers of St Clarets, couldn't prevent a Championship exit in the group stages. In March 2005 St Clarets GFC lost one of its founding members and a man whose DNA was evident in every aspect of St Clarets GFC. A truly dedicated and honourable family man and Gael, Denis's funeral brought together many former team mates of his and players who had played under him. He will be forever remembered and respected by members of St Clarets GFC. To read this tribute to Denis McCarthy, just click on the image to enlarge(adobe reader required). St Clarets and Thomas McCurtains will have another opportunity to salvage their intermediate status after the two sides could not be separated at Ruislip on Sunday. Patrick Lynott will rue his missed second half penalty which could have negated the need for a replay, but Clarets were also indebted to one outstanding save from goalkeeper Paul Myers. had first use of the breeze and led thanks to points from Phil Daly and Lynott. Barry Morrison got McCurtains up and running but a lazy swing of the boot from Lynott restored his side's two point cushion. Sweeney fired over before a long ball was allowed to bounce through to Lynott, only for the Clarets man to slice high and wide. Lynott did, however, add a free before blasting the ball into the sidenetting. scores from Eamon Colleran and Paddy Donaghy gave Clarets a precarious four point lead at the break and they extended it upon the restart through Barry Lynch. But McCurtains had introduced Conor Mansell at the break and he would prove a thorn in the side of Clarets in the second half. Mansell reduced the margin to a goal, with Clarets struggling to break out of their own half, and then pounced again after the Hayes side were guilty of giving the ball away cheaply. Myers, a late arrival at Ruislip, was introduced for Mullane, with McCurtains peppering high ball into the Clarets' goalmouth, but the action switched to the other end as Michael Joyce smashed the ball off the McCurtains crossbar, before firing over. Myers then justified his introduction by saving magnificently from Joe Oats acrobatically turning his fierce shot over the bar. James Loanne reduced the gap to a point before James Collins hauled down Donal Butler, and referee Ger O'Shea awarded a penalty. Lynott dragged his spot kick wide of the post and McCurtains immediately levelled through Loanne, and seemed to have the momentum with them going into the last ten minutes. But neither side could muster a winning point. St Clarets: Roary Mullane; John Hickey, Stevan Sherry, Michael Hickey; Phil Daly (0-1), Paul Davis, Aidan Donaghy (0-1, 65); Paddy Donaghy, Mark Collentine; Michael Joyce (0-1), Eamon Collerhan (0-1), Patrick Lynott (0-3, 1f); Paul Nolan, Barry Lynch (0-1), Donal Butler. Subs: Paul Myers for Mullane, Tony Murphy for Collentine, Matt Healy for Michael Hickey. The wind and rain that had held off for the previous games finally arrived to make this play-off a slippery affair at times. Thomas McCurtains battled hard but were always up against it after conceding an early goal. It was Patrick Lynott's predatory instincts that would set Clarets on their way to victory. Livewire Lynott would play a massive part in his team's victory and embodied their spirit of a hungry team that were determined not to lose. Good scores from Barry Lynch, Eamon Colleran and Michael Joyce would soften Clarets' cushion. The game got a little bad tempered at times, with McCurtains' O'Flaherty not taking kindly to how Lynott was grabbing him. There was a lot of the shirt pulling going and it did look at times like things could boil over. When it came to getting the scores, Clarets were more on the ball and able to take a 1-05 to 0-03 lead in at the break. However there would be a twist in the tail. Despite looking impotent in attack up to the point, Thomas McCurtains' Fitzmaurice would float a delicious ball into the square and McGrael would sneak in to fist it home. It seemed Thomas McCurtains would make a game of this after all. It would not end there either, as Brodogan would break through the Clarets defence and when he did, he almost broke the net with his powerful shot that beat the goalkeeper. It was a brave fight back from the East London team, but still not enough to wrestle the lead from the side that had led all along. Donal Butler, who had been accurate with his frees all afternoon, would punish McCurtains for anything they gave away. Lynott followed up with an impressive point that came from an almost impossible angle. Thomas McCurtains mounted a brave challenge but were defeated by a team that wanted it more and performed better over the course of the game. While McCurtains were impressive in patches, Clarets were in attendance from the start to the finish and deserved victory in relegation decider. St Clarets: Paul Myers, Sean McCarthy, Steven Sherry, John Hickey, Aiden Donaghy, Paul Davis, Matthew Healy, Colin Browne, Mark Collentine, Patrick Lynott (1-2), Eamon Colleran (0-1), Michael Joyce (0-1), Joe McCarthy, Barry Lynch (0-3), Donal Butler (0-3). Subs: Tony Murphy (0-1) for Joe McCarthy, Gary Wynne for Donal Butler, Niall Comer for Matthew Healy. After another successful year, St Clarets celebrated in style, giving the WAGS the chance to dress up. Sadly the reporter that night must have been a little the worse for wear, as he got most of their names mixed up. Hopefully the men involved didn't do the same at the end of the night!! A Dublin representative team travelled to London in the early 1980s to take on the London minors. St Clarets were well represented on the team. To read the match report, just click on the image to enlarge. Senior figures from the Hillingdon Irish Society and St Clarets GFC came together for the presentation of a cup designed to encourage the continued promotion of Gaelic games in the Hayes and Hillingdon areas. To see a bigger version of the picture, just click on the image to enlarge. A little flash back to the 1970s and a presentation evening in Botwell.